was created out of our love for knitting, crocheting, felting, spinning and all things fiber related. My need to explore creative expression has taken me in many directions, all marked by my deep love of shape, form, movement and color. I have a BA in Art from Marygrove College and Art Education Certification from Wayne State University. Over the years I have taken a variety of drawing and painting classes, and I have studied pottery at The Art Center (now the Anton Art center) and at Oakland Community College. I taught Middle School Art in a public school, and have taught a variety of painting, pottery, and fiber art classes and workshops. My current body of work includes watercolor, jewelry and fiber arts. I hand dye fibers to use in spinning and needle-felting. 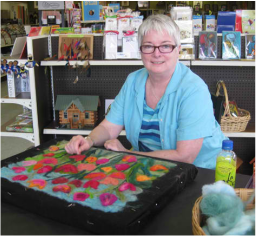 I spin fibers and create needle-felted paintings using watercolors as my inspiration. I hand dye the fiber to use in each “painting”. My love of color has moved me beyond painting on paper to creating on fiber and fabric. When I was only five years old my Scottish babysitter taught me how to knit, crochet, and embroider. Since she was Scottish and frugal, she also taught me how to darn socks. All the way through high school she continued to teach me wonderful handwork skills. I have a BA in Food Science and Nutrition from Marygrove College and Marketing and Communications from the University of Detroit. Fate has an amazing way of bringing people together! Here we are, two Marygrove grads, doing what we love together. Mary and I met while she was teaching handwork at a school where I was working as the Advancement Director. I enjoy combining various techniques to create something unique. Our hand dyed yarns and fibers and the specialty yarns and fibers that we select for our creations result in the most amazing accessories and items of clothing! I enjoy wearing something that we have created; after all, who doesn't like to have a one of a kind item to add to their wardrobe and have someone ask, "where did you get that"! ?